Based in Chicago, Jenny Keefe has more than 10 years of experience writing and editing for a variety of industries. She works in the corporate financial sector. Keefe holds a B.A. in English from the University of Northern Iowa. Tights have transitioned from a sometimes accessory to a go-to essential for women’s outfits. Colored tights work with a variety of shoe styles, but fashion gaffes can occur when pairing the two. 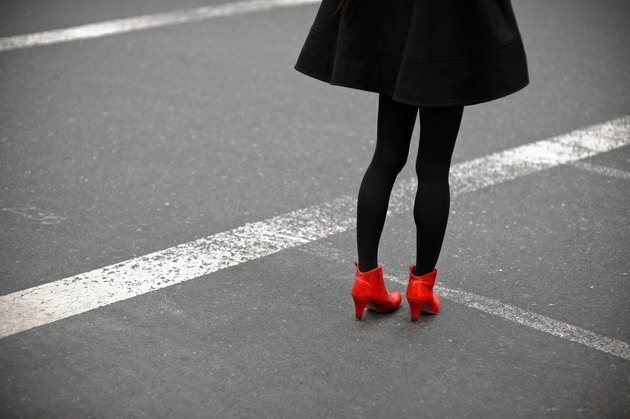 Simple is always better when pairing tights with shoes and coordinating outfits, and can result in some dramatic looks. Make sure two components of your outfit match. Don’t wear tights that are not the same color or in the same color family as your skirt, dress, top or shoes. Nothing hampers an ensemble like wearing a gray skirt with blue tights and black shoes. When your outfit is broken into three different colors, it makes you look shorter and heavier. Examples of effective "rule of twos" outfits include a purple dress with purple tights and chocolate boots and a flowered dress with gray tights and gray pumps. Colored tights are everywhere, and can give an outfit a welcome pop of color, but if you opt to wear tights in the same color family as your shoes, make sure the tights are the same shade or a lighter shade than your shoes: navy pumps and light-blue tights, for instance, rather than the reverse. Pair tan tights with chocolate flats with a green pencil skirt or rose tights with darker burgundy Mary Janes and a black tunic. For a maroon mini dress, go with heather tights and black riding boots. If you dress in ankle boots, don’t choose a different-colored tight; wear the shoes with matching tights for a look that's leg-slimming. Breaking up colors at the ankles will make your legs look shorter, not longer. Black ankle boots and tights are an easy way to emphasize a colorful dress. For thick wool and ribbed tights, chunky-heeled ankle boots look best. To play it safe, keep the open-toes at home when wearing tights. The combination – tights, then shoes, then more tights peeping out at the toe, often with a seam at the tip -- just looks awkward . If you do want to make the taboo combo work, use high heels, not flats, and skip the reinforced toes on the tights.